The Meredith Sport is part of the Grey's Anatomy™ Collection by SoftWalk®; designed for those in the nursing, hospitality and other occupational fields because of its ability to provide unmatched comfort and support. If you love Meredith, you'll love this slip-on that is sure to get you through a long shift. Premium printed leather uppers with a round toe. Easy slip-on style with a cushioned collar and goring at instep. 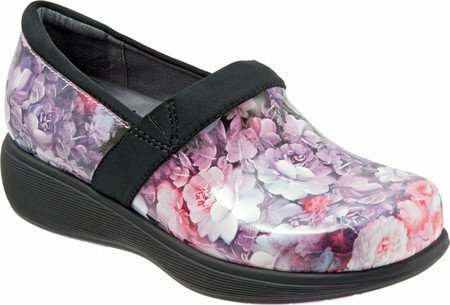 Soft breathable antimicrobial microfiber footbed lining with leather heel and arch inserts. Features a removable contoured footbed with added arch support for all-day comfort. Click here for more information on the patented SoftWalk® footbed. Offers a stabilizing nylon shank for added support. Tested for wet and dry conditions and meets or exceeds standards for SATRA TM testing. Lightweight and flexible EVA sole with molded slip resistant rubber inserts. Imported. Measurements: Heel Height: 1 1⁄2 in Weight: 12 oz Product measurements were taken using size 7.5, width M (B). Please note that measurements may vary by size. The Meredith Sport is part of the Grey's Anatomy™ Collection by SoftWalk®; designed for those in the nursing, hospitality and other occupational fields because of its ability to provide unmatched comfort and support. If you love Meredith, you'll love this slip-on that is sure to get you through a long shift. Premium printed leather uppers with a round toe. Easy slip-on style with a cushioned collar and goring at instep.